Saint Pope John Paul II in Drogheda in 1979 (Photo: Government of Ireland). The role of St Pope John Paul II in the Northern Ireland peace process is told in a documentary film due to be released in Irish cinemas on Friday. 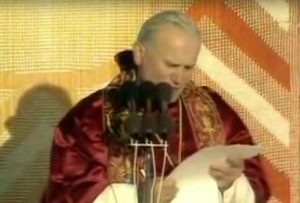 John Paul II in Ireland: A Plea for Peace is directed by David Naglieri, who won two Emmy Awards for another documentary about the Polish-born Pontiff, Liberating a Continent: John Paul II and the Fall of Communism. He has directed about a dozen documentaries with Catholic themes. The director’s latest film looks at John Paul II’s visit to Ireland in 1979 and the inspiration it provided. Armagh priest Fr Paul Clayton-Lea reveals how the visit helped inspire his vocation, and former IRA bomber Shane O’Doherty tells how Pope John Paul II’s words helped him return to God and renounce violence. However, the documentary also tells how John Paul II’s words inspired Redemptorist priest Fr Alec Reid. That joint statement led to the 1993 Downing Street Declaration by British Prime Minister John Major and An Taoiseach Albert Reynolds which affirmed the right of the people of Ireland to self-determination, and that Northern Ireland would be transferred to the Republic if the majority of the people in the Six Counties were in favour of such a move. Ultimately, that paved the way for the Good Friday Agreement of 1998, which brought in a power-sharing government in Northern Ireland, reform of the Northern Ireland Police Service and – so far – a lasting peace.